This apartment building is just below the steps featured in yesterday's photograph. 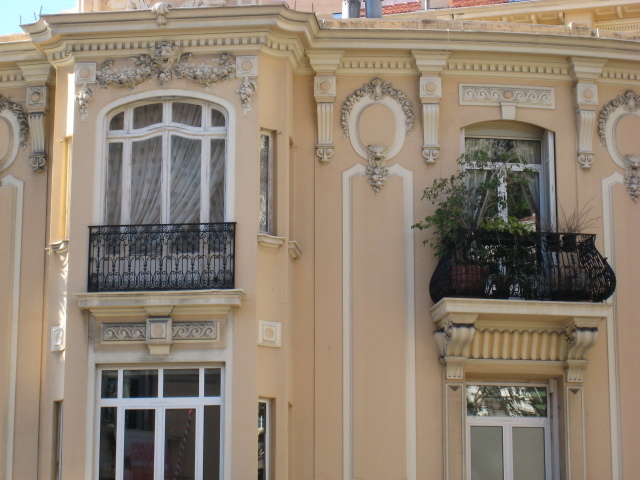 I love the detail in the design and the ornate balconies - even the sweep of the curtain at the window on the left. Those apartments do look beautiful - I wonder what they look like inside? Like Kerry-anne, I wonder too - how expensive it would be to rent those? It would be expensive. Just look at those french doors and the shape. They'd have to be made individually...I could live in this building. Oh, I do love ornate! I wish new construction had more character like the buildings of the past. The apartments look nice. I couldn't afford to live there but I can enjoy them through the pictures you take.